A lovely sunny, albeit little cool, morning here. Today’s post is something a little different for me. I don’t normally do upcycling/ recycling…but I had two silk pieces languishing in my wardrobe and couldn’t bear to get rid of the beautiful fabrics, so I decided to make a blouse. First let’s take a look at the original pieces, shall we? 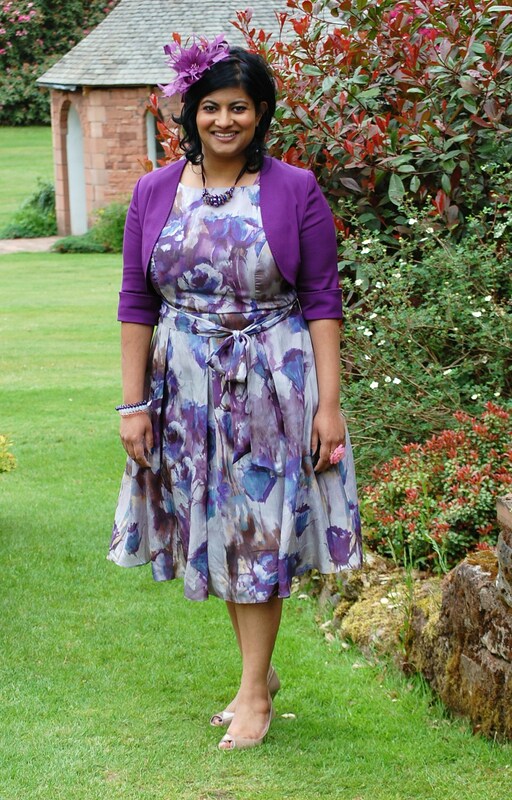 Me circa 3.5 years ago, wearing a silk fit and flare dress purchased online from John Lewis. The first silk piece came from this silk fit and flare dress that I purchased about 3.5 years ago to wear to a friends wedding. I have never worn this dress since then. Why? Truthfully the fit was never perfect, it was sleeveless (don’t like sleeveless) and have not had an occassion to wear it since then. 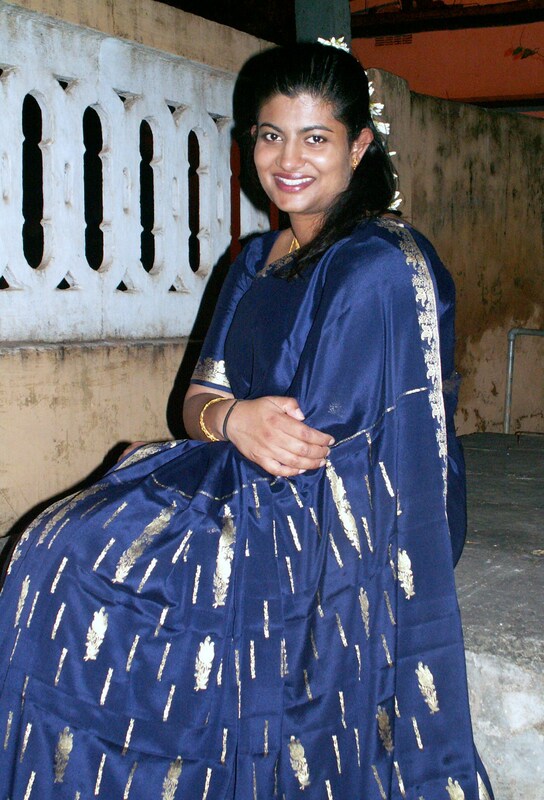 Me about 10 years ago wearing a silk saree. The second silk piece came from this silk saree. I know the colour in this photo looks very different to the colours of the blouse, but trust me, they are the same fabric. So the pattern is of course the Sutton Blouse from True Bias. I selected this pattern specifically for this project because I knew I wouldn’t have enough of the floral dress silk to make a blouse in its entirety. You can see I used the dress silk (cut from the skirt portion) to cut the main body pieces, and some of the silk saree to cut the contrasting yoke. The silk saree is probably closest to a crepe de chine. Before anyway points it out, I made the deliberate choice to cut the main body of the blouse with the flowers pointing downwards because that was the only way I could fit the pattern pieces on to the fabric. And I am fine with that. In terms of the pattern itself – check out my full review below. I was dubious before starting sewing what this pattern would be like but I have to give Kelli full marks for the instructions – they are brilliant. Don’t be fooled in to thinking this is a simple sew. It is a fairly simple design, yes, but Kelli’s instructions are written specifically with sewing fine fabrics in mind and the finish is wonderful. It was actually quite a challenging sew and I learned lots doing it. True Bias Sutton Blouse made from upcycled silk – inside finish – neckline finished with silk bias facing, yoke seams sewn with french seams and side seam neatened with overlocking. Another thing I wanted to point out is that I pre-washed my fabrics. I don’t do dry cleaning, unless it is something I know I will only wear occassionally. I would not take a silk blouse to be dry cleaned every couple of weeks. So even though the dress was labelled as dry-clean only I pre-washed it, together with the saree using a silk specific detergent and a colour catcher sheet. I did get a little bit of bleeding but not that you would notice much. Don’t try and wash silk or wool with a detergent which contains biological enzymes – they will destroy your fabric! The Sutton Blouse is a loose fitting V-neck top with kimono sleeves, a one piece yoke, and a back inverted pleat. The back is longer than the front and includes slits at both of the lower side seams. Instructions are top notch. I am a fan of Big 4 patterns – anyone that reads my blog knows that – but if this were a Big 4 pattern it would not tell you how to finish the insides the way the instructions for this particular pattern do. The inside finish is beautiful. 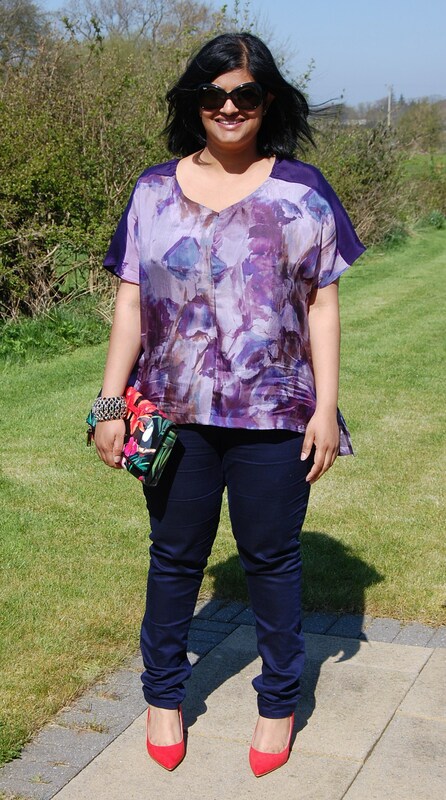 This is probably a slightly challenging sew simply because of the kind of fabrics you are likely to use to make this top, but if you follow the instructions you will end up with a beautifully finished and constructed piece. 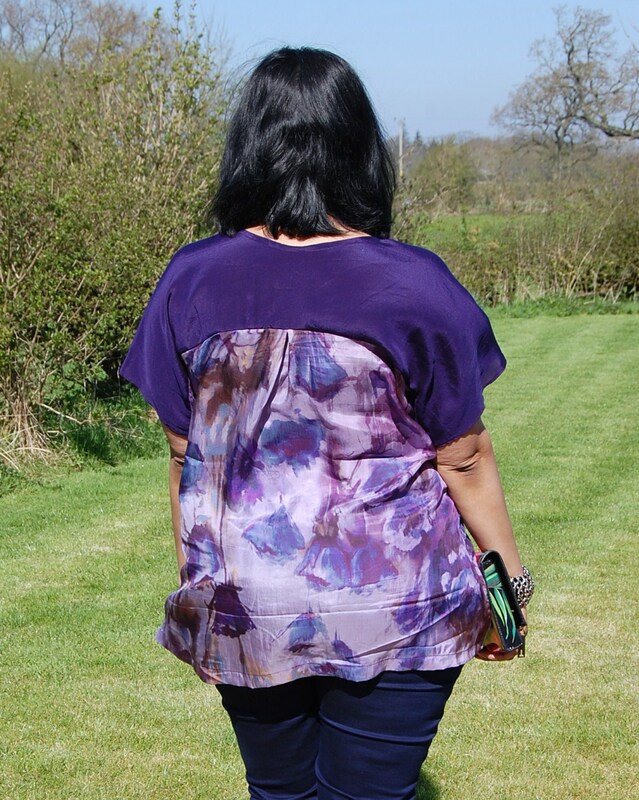 I love the finished top – so light and comfortable and easy to wear. I didn’t like the fact that there were no finished measurements provided and also I would have liked a neck to waist measurement to be given. Kelli (the designer) tells me she is looking into adding the finished measurements to future patterns. Upcycled silk from a silk dress and a silk saree. Aside from adding 1 inch to the length of the pattern and maybe an inch at the hips – nothing. 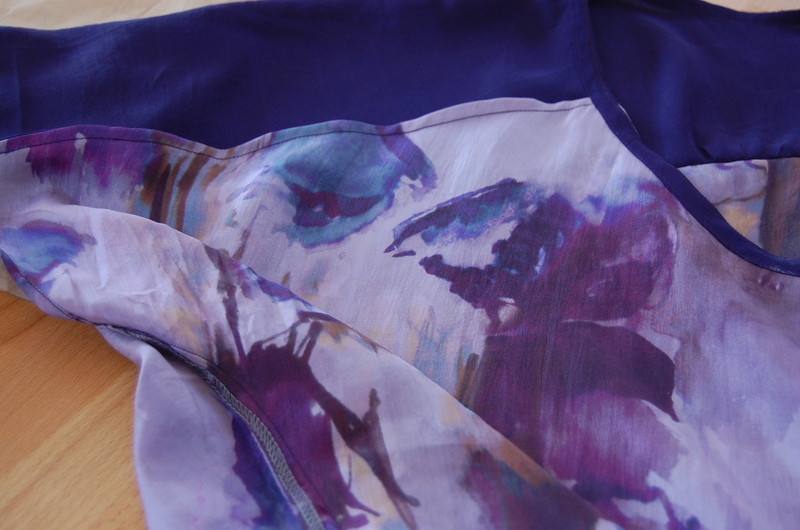 Very pleased that these beautiful fabrics have found a new lease of life in a more wearable garment. Great easy to wear piece. This is a great use of those two fabrics/outfits. The colours go really well together and make for a very expensive looking top. I was looking at this pattern the other day and I think I’m now tempted enough to try it for myself. This is exactly what I was going to say. I keep thinking about this top and although I’d probably have to grade it up a size, if it turns out half as nice as this I think it would be worth it! Thanks Sam. I think you would really like this top. Thanks Sam – give it a go! Just lovely. I’ve made this one and I too really enjoyed the process and how professional it is on the inside with all those lovely french seams. You’ve really done your fabric justice. Thanks Lucie. Love your version too! Such a lovely way to breathe new life into unworn garments. Beautiful blouse. It is beautiful!!! I did not notice that the flowers were upside down…they look like that’s the way they should be. Did you notice the way the neck comes together in the front it makes it a little bit heart shaped? Awesome!!!! What a fabulous way of salvaging fabric from garments you no longer wear. I love the colour combination, and the pattern of the top is so lovely. Great new top! Manju this is beautiful. I LOVE that you upcycled two great fabrics in to one great top. I am all about upcycling, and should probably post more upcycled projects to my own blog. Fantastic job on this!!! Also, I too throw my silks in the washing machine, using homemade detergent (white vinegar and baking soda). Keeps them clean and bright! Thanks Ebi and another good tip on the washing of silks. Hi Suzanne, well, I am waaay bigger than a D and I had no issues on fit at the bust. But, we are all different right? Hope it works out for you. love it, super chic top and great use of the two fabrics. 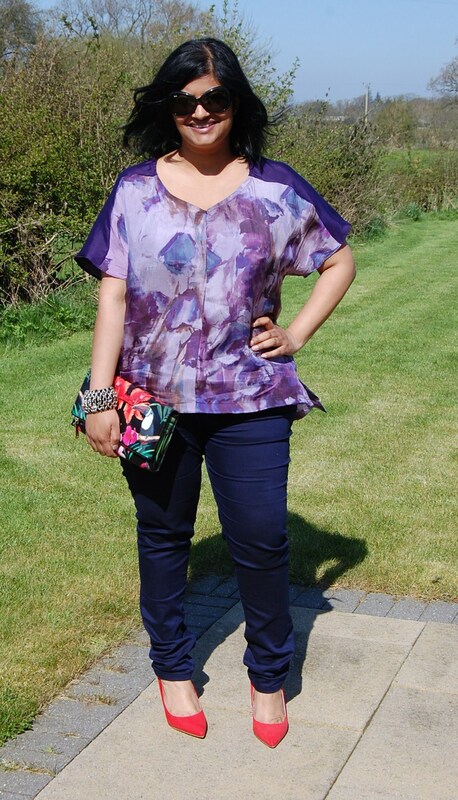 Love this one, your fabric choice was perfect for this top and it looks great on you. I only have one silk garment, when I bought the fabric I actually asked the manufacturer how I can wash it and they advised to wash it by hand with shampoo and then rinse it with a small amount of white vinegar in the water. Thanks Idaaidasewing. Good tip on the washing too. Absolutely beautiful. Love it! You look stunning, and the colors work perfectly. I think that this is the most beautiful version of the Sutton blouse that I have seen. Everything about it is perfect. You look stunning! LOVE the colors! It looks easy to throw on and be instantly stylish. Nice work! Your upcycle came out beautifully! I’d love to have seen the insides! I haven’t worked with delicate fabrics, yet, but I didn’t know there is a silk specific detergent! Thanks for the tip! 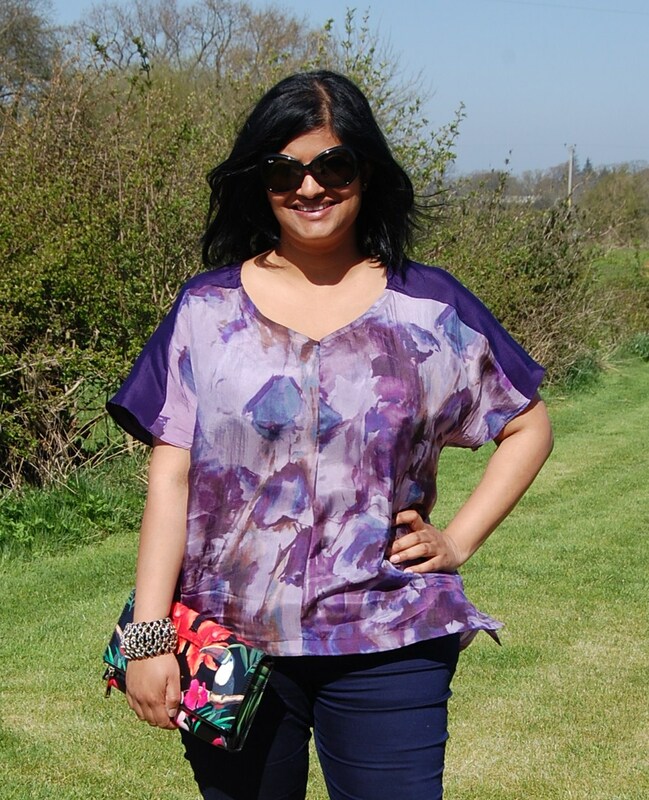 Just discovered your blog via the Curvy Sewing Collective, and I *LOVE* your style! Your Ginger Jeans look increeeeeedible. Now I really want to make a pair lengthened at the bottom to get that little “scrunch” at the ankle too!